My fourth guest in this series is poet and poetpreneur-extraordinary, Hilda Sheehan. I have a vivid memory of seeing Hilda read at a Kent & Sussex Poetry meeting and she seemed to lift everyone out of their seats (and comfort zones, I suspect!) with her warmth and often bonkers humour. Hilda is forever associated in my mind with Swindon – Poetry Swindon and in particular its annual Poetry Festival, an event which seems to be always growing in stature without losing its friendliness and charm. She’s also written two full collections and masterminded countless other creative projects. All this and five children. I’m exhausted just writing it. Andra Simons – The Joshua Tales – took my breath away, totally original, exciting, shocking and tender. 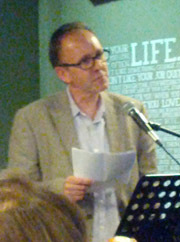 I read it in one wonderful event of not being able to put it down and then booked him to read at the Poetry Festival. His performances are as breathtaking as his page words – an outstanding poet who I hope more people will come to appreciate. He’ll be at the Poetry Swindon Festival on Sunday 9th October. This is indeed happening to me now – I think writing lots and publishing less is a good thing. I stick 80% in the drawer and then consider a few to send out into the world. The London Dungeon after hours. No … only if I want to support the organisation. I’m not sure my work is suited to winning competitions – too scrappy and out-of-control. I generally point people to the ‘Staying Alive’ anthology by Bloodaxe Books. I love the range of poems, and it still feels fresh to me. The Poetry Magazine Podcast is a friendly way to hear about poetry and why we love it. 6 – You’re asked to give a reading at the Royal Festival Hall, to thousands of people. What goes through your mind? 7 – Why is end-rhyme considered a good thing in performance poetry, but rarely found in contemporary magazines? QUICK PLUG: Hilda is the Creative Director and founder of Poetry Swindon Festival. This year it will be held at the picturesque Coate Water Country Park, the birthplace of one of the world’s greatest nature writers, Richard Jefferies. 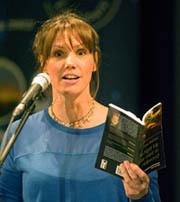 The festival is renowned for creating warm and welcoming poetry events, providing great poetry with enjoyment at its heart. The Big Poetry Weekend features dozens of poets and takes place between 6th to 9th October 2016 with Andrew McMillan and Kim Moore as poets in residence. Click here for details and tickets, including accommodation packages. What Hilda says in #2 makes sense to me 🙂 And the Swindon Festival looks like a great event.